HAVING a vision is so crucial. Whatever one sets out to do, without a dream, there will be no vision. And without a vision, there will be no goals, or milestones leading to that goal. Desa ParkCity celebrated its 10th year milestone when one of its 10th precincts bagged FIABCI’s Prix d’Excellence Award (residential – low rise category) at the 61st World Congress of the International Real Estate Federation (FIABCI) held in Bali last week. The 11-acre Adiva precinct comprising 160 triple, double-storey and walk-up apartments set against linear parks within the masterplanned development of Desa ParkCity became the world’s best in a property showcase which saw 54 entrants from 11 countries competing for 14 categories. FIABCI is the French acronym for the Paris-based federation. It was a milestone for both Perdana ParkCity Sdn Bhd, a subsidiary of Sarawak-based Samling group, and its group chief executive officer Lee Liam Chye, who has been steering that project from its conception. The two are synnonymous. The victory also cements the successful rebranding of that location. The success of Desa ParkCity goes back to 1999, a year after the 1997/98 Asian financial crisis. That year, Lee, together with several others, visited a quarry mine adjacent to Bandar Menjalara in Kuala Lumpur. Lee describes that 473 acres a piece of wasteland – “a hot potato that no one wanted” – with ravines, ridges, a hillock and parts of it secondary forest. A little known figure in the property world, Lee, from Penang, was educated in Britain. He has a Bachelor of Science (honours) in estate management from the University of Southbank, Britain. He spent several years with Penang City Hall’s valuation department before joining the private sector. His previous projects include One Ampang Avenue, an apartment sitting atop some shops, and another project in Cebu, the Philippines. ParkCity is his big break. “I’ve always asked myself why certain places in Britain and France, especially Paris, evoke strong emotions within me. These places promote concepts and percepts which are fundamental. Some of these cities may have been built a long time ago, but the fundamental concepts upon which they were built remain relevant until today. Only technology, the way things are done and building materials have changed, but ideals and the idea behind them remain relevant,” says Lee. He had a vision to build a master planned development with landed strata units set amidst gardens and parks, with the living area overlooking a garden instead of the car porch and commercial amenities within walking distance. At that time, the only strata-titled projects were condominiums. 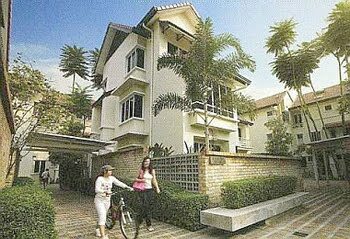 Adiva in Desa ParkCity, homes in a park. Adiva won the residential (low rise) category in the FIABCI Prix d’Excellence Awards 2010 at the 61st World Congress of the International Real Estate Federation in Bali. Said Lee during a 2003 interview, his first with StarBizWeek: “When I saw that piece of land, I saw the challenges, but I also saw the potential.” During that interview, he talked about creating a sense of place and space, with trees and parks all within a community. Seven years later, a day after picking up the Prix d’Excellent award in Bali, Lee says: “There has to be commitment. You have to be genuine in what you want to build and from that point onwards, opportunities for innovation and creativity will come. Prices of its landed properties have gone up quite a bit. 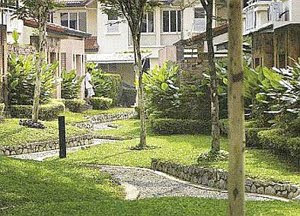 When Safa, a non-strata development, was launched in 2002, it was priced at about RM400,000. Today, they are changing hands at about RM1.3mil. A three-storey Zenia, priced between RM800,000 and RM900,000 in 2005 is now ranging between RM1.6mil and RM1.85mil. With each new subsequent launch, prices of older precincts have increased. City Hall has approved 13,000 housing units. Lee says they will only build half of that. Today, Lee will be holding a priority launch for about 2,000 registrants for its latest condominium The Westside One. He calls the 40-storey block of 338 condominium units “branded residences”. Sizes range from 969 sq ft to 2,066 sq ft with prices averaging RM580 per sq ft. This will be the third condominium project there. There will be several more condominium projects there with invariable density. On June 26, he will be holding a priority launch for Casaman, a gated and guarded strata-titled 147 units of two- and triple-storey terraced homes with superior finishes. “Casaman will be our most ambitious and will be different. It will have built-ups ranging from 3,100 sq ft for double-storeys and up to 5,300 sq ft for triple-storeys,” he says. Prices range from RM1.7mil to RM2.9mil. Are houses there overpriced, as claimed by some? Views differ. Some agents say there is a bit of a bubble in that location. But the demand continues to climb. “Prices have been holding up well simply because there is a demand for landed strata-titled units. Those who buy into that community want the security,” says an agent familiar with that location. Other projects in that area include Sunway SPK Homes, adjacent to Desa ParkCity, and Villa Manja, both by the Sunway group. Each of them have piggy-backed on the success of ParkCity but they lack the space and amenities available at ParkCity. Recently, Sunway launched 180 townhouses with built-up of about 2,500 sq ft priced between RM1.03mil and RM1.1mil. About 80% are sold. One of ParkCity’s biggest price boosters is its commercial area The Waterfront, which comprises a supermarket, eateries and a clubhouse. When Tesco opens its new supermarket in Bandar Menjalara, this may dilute some of the traffic at The Waterfront. As the community evolves, other components are being added – a private hospital to be operational in 2012 by the Sime Darby group, and an international school by next year. PROPERTY developer Johor Land Bhd has bought Wisma Time on Jalan Tun Razak in Kuala Lumpur for an estimated RM78 million, sources say. The building is owned by STLR Sdn Bhd, a wholly-owned unit of Khazanah Nasional Bhd. The 12-storey freehold building with a mezzanine floor and two basement car parks has a nett lettable area of 171,611 sq ft. It is understood that Johor Land, a Johor Corp company, has bought the property for investment. "The price is inclusive of a renovation amount ... the building is being renovated now," a source told Business Times. In April, it was reported that the building, which is located on the same row as Menara AA and Wisma Technip, has an indicative price of RM80 million. At that time, the occupancy at the building was quoted as 68 per cent. "It is now almost 90 per cent occupied," the source said. Officials from Knight Frank, the advertising and handling agent when contacted to confirm the sale, declined to comment. However it is believed that the deal, which was signed last month, was jointly closed by Knight Frank and CH William Talhar & Wong. The building, originally belonged to Time Engineering Bhd. It was sold to STLR for RM62.05 million in 2002. Johor Land was delisted in July 2009. Based on the last financial statement submitted to Bursa Malaysia, in the year ended December 31 2008, Johor Land made a net profit of RM5.66 million on revenue of RM51.03 million.